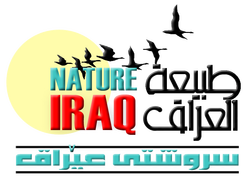 Nature Iraq is an Iraqi non-governmental organization registered in Iraq, accredited to the United Nations Environment Programme (UNEP) and Iraq’s first and only Affiliate to BirdLife International. We work to protect, restore, and preserve Iraq’s natural environment and the rich cultural heritage it nourishes. Our staff is comprised of a diverse group of extraordinarily dedicated and deeply concerned scientists, birding photographers, environmentalists, administrators, interpreters and translators, logistics experts, IT and communication specialists, and a few “experts in general.” Our in-house staff members are representative of numerous sects and segments of Iraqi society, and include a few Iraqi expats and international stragglers as well. Additionally, Nature Iraq staff is augmented by hundreds of international and Iraqi consultants who work behind the scenes analyzing data collected from our ongoing Key Biodiversity Area surveys, and helping to build the capacity of our Iraqi employees by way of specialized training sessions and workshops. Indeed, Nature Iraq is constantly organizing training and education programs for its staff, ministry employees, university students, and other NGOs. Recent educational programs have included GIS/Database application instruction, and workshops in plant and bird identification, scientific report writing, and computer applications for data management. Inspired by a love of nature and desire to see Iraq secured of a healthy and socio-economically viable future, we at Nature Iraq work together under the current adverse conditions and at certain risk to our lives, determining and monitoring the current state of Iraq’s environment. As this information is analyzed, we compile and install various sustainable projects that we hope will ensure protection, restoration and preservation of Iraq’s natural environment and the rich cultural heritage it nourishes.